Raccoons love to forage in dumpsters. Human garbage and pet food are prime food sources for raccoons, and part of the reason that raccoon densities are so much higher in cities than in the wilderness. Below we see a case in which two juvenile raccoons, not quite adults, foraged in a dumpster and got stuck. I had to arrive and remove them, place them in cages, and relocate them. Once a raccoon finds a food source such as a trash receptacle, garbage can, or pet food dish, it will continue to return for a long time. 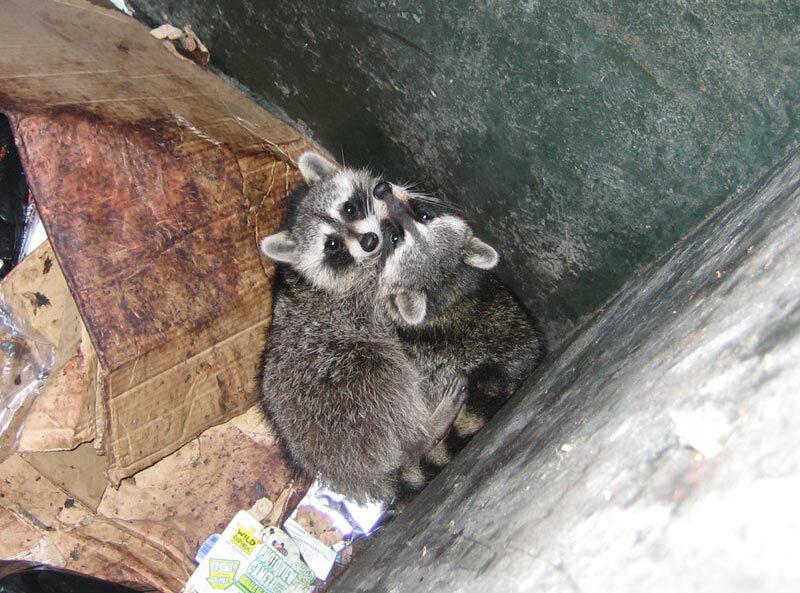 Here we see the two juvenile raccoons huddled in the corner of the dumpster. They entered in search of food. 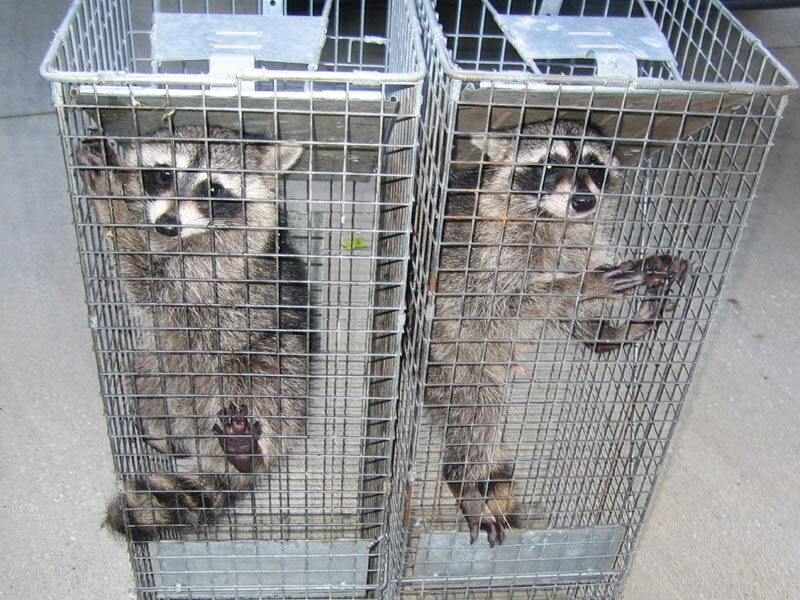 I removed them with a snare pole and placed them in these cages before relocating them. Please remember to keep your lids on garbage cans and dumpsters. If raccoons are tipping over garbage cans, secure them in some way. Strap down the lids with bungee cords. Store the cans inside the garage. Concrete blocks, etc. If you need to get rid of raccoons in dumpsters or remove raccoon from dumpster, it's best that you call a professional wildlife control professional, rather than risk doing it yourself. Raccoons can deliver a very strong bite or scratch, and they can carry various zoonotic diseases, such as rabies. Click here to learn more about wildlife diseases. How do you remove a raccoon stuck in a dumpster? From our point of view garbage is useless and a dumpster is meant for throwing away useless products, but this is not always the case because if you will think from the perspective of raccoons, then a dumpster is not less than a big dining hall for them because they can find more than enough for eating there. Raccoons are known to be omnivorous, animals and because of this reason they can eat almost everything without any sort of issue. They have no selective food preferences and can survive on anything depending upon the prevailing conditions. This is one of the great reasons present behind the fact that these animals have adapted to different urban environments in a successful manner. For us garbage cans or dumpsters are simply useless, but they are special for raccoons in fact in many houses where garbage cans are not sealed properly raccoons are seen as regular visitors. They will not waste time after sighting a can and will immediately get inside a dumpster because it is a great treat for them in all cases. However, sometimes they end up in great trouble after being attracted towards dumpster because once they get inside it becomes very much difficult to get out. As mentioned earlier that raccoons act as popular sources of foods for these animals and they jump inside these without even thinking much. After feeding themselves they normally climb onto rubbish for getting out. However, in a number of situations when the dumpster has been emptied they find nothing to climb out and get stuck. This situation is very much complicated for the animal because no matter how much it tries getting out is almost impossible without support and in majority of cases only humans can provide assistance here. In case you also find raccoons stuck in a dumpster, then follow the below mentioned tips because the animal needs your help badly here. First of all don’t panic after seeing the animal as it is already in great trouble and if you will react in a negative manner, then this can turn it hostile. Try to find branches, cardboard, or a large piece of wood and place these inside the dumpster in a careful manner. The animal will use these as support for climbing out of the dumpster. You can also throw some more trash inside dumpster as it will again help because raccoons will get the much needed support for getting out. Take help from others and tip over the dumpster it will again make the animal free, but this is a difficult approach. In case you don’t know what to do, then give a call to animal control they will take care of the matter.